Lake County Eye: Does BGLCC Stand for NSFW? Look out Pornhub, the Chicago Tribune is breathing down your neck. 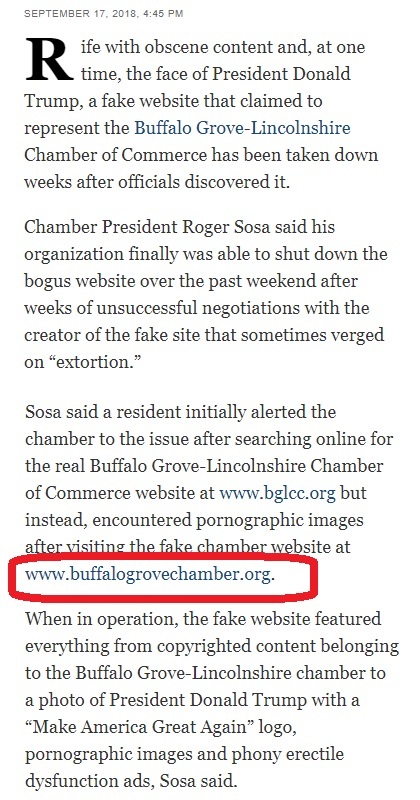 Rife with obscene content and, at one time, the face of President Donald Trump, a fake website that claimed to represent the Buffalo Grove-Lincolnshire Chamber of Commerce has been taken down weeks after officials discovered it. Note to Ops: Don't you just hate when this happens to you? Your LakeCountyEye certainly does. The fake website is circled above. Spoiler Alert: Contrary to what the Tribune story implies, the hyperlink is active. And there is a reason why the hyperlink has not been posted on this blog.